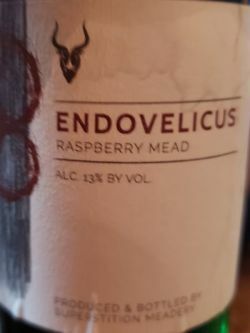 Mead made with Arizona Mesquite Honey and Raspberry Juice, aged in a Sandeman’s Tawny Port Barrel. Bottle shared with friends. Pours a dark ruby, no head and a bit of alcohol-legs. Concentrated raspberry jam, so intensely fruity, insanely tart and sweet all at once. Subtle port and a nice honey sweetness. So full, juicy and gorgeous. Bottle at Hattten. Another concentrated berry juice bomb. Velvet raspberry, super sweet, some barrel presence. A delightful mix of Sandemans Tawny Port flavors along raspberry (juice) supported by alcohol and honey sweetness. It's really good, I enjoyed it. Échantillon de la part de kbudd19, un grand merci! Couleur bourgogne, apparence légèrement voilée et de belles jambes qui restent sur les parois du verre. Au nez, ça fleure bon le porto avec les framboises et des notes florales. Au goût, c'est étonnamment pas si sucré et le mélange porto/framboise, miel et alcool est particulièrement agréable. Corps moyen. Pas de bulles. Texture vineuse et un brin huileuse. Finale de framboises qui persiste longtemps. C'est vraiment excellent. Je retrouve des notes très claires de la maison Sandemans et ça se marie vraiment bien avec les framboises. Très savoureux! Bottle shared at Matt’s. Big fruit barrel nose with lots of raspberry jam in taste. Very good. Another concentrated berry juice bomb here. The grape from the port adds a thick velvet like complexity to the berries, the background is a strong honey flavored sweetness. This one has that same odd aroma as the last one, almost balsamic. Very odd. Thankfully tastes so much better. Ripe raspberry, very tart, very full flavored and delicious. The finish lingers on the tongue, very acidic, even a bit tongue puckering tannin too. Very yummy mead, but the aroma and finish aren’t for me. Dangerous Bottleshares XL forealz edition. Pours a deep deep dark red with no head. Aroma of raspberries, raspberries and raspberries in different shapes and conditions. Also some syrup, honey, vanilla, slight strawberries and decadentness. The taste is sweet and sticky with notes of.... raspberries, sweet port, syrup, honey, cherry wine, slight tart raspberries and vanilla. A very very hard mead to hate. Bottle thanks to Jeff and Jen from superstition at Dangerous Bottleshares XL 4Realz Edition Motherbrother, Hoprider and Aaron. Pours a very dark reddish purple clear. Aroma has PACKED with raspberry, port wine, pretty tart, vinous, slight hints of heather honey spicy and floral notes. Taste is pretty tart, slight pithy raspberry bitterness and a heavy, oily sweetness leading to a nice, organic, floral honey finish. Super oily texture. Very tasty! Bottle thanks to the Jeff and Jenn from Superstition. Thank you so much guys. Pours deep beautiful dark red. Aromas of tart raspberries, port, subtle tannins, sweet honey, subtle floral. Taste is jammy as hell, tart, subtle vinous dryness, tannins, honey. Damn.